The Tyvek-wrapped Wall Street Place, visible from the “Leonard Street municipal lot,” in June. Mayor Harry Rilling declined to comment Monday when asked by NancyOnNorwalk about the proposed settlement with The Hanover Group, sued by Norwalk when it refused to cover the loss from a $894,464.83 payment to a fraudulent third party. The Common Council approved the proposed settlement Tuesday; Rilling and Corporation Counsel Mario Coppola say a statement will be released once the settlement is final. Rilling and Coppola disagreed slightly Tuesday about when the “explanatory statement” promised by Rilling would be coming out. Coppola said late December; Rilling said maybe mid-month. Rilling and Coppola said Tuesday that the statement might be released after a Dec. 13 mediation with Citibank. “It depends on how things go,” Rilling said. Norwalk in June declared Citibank to be in default of its agreement because it has missed its deadlines to complete Wall Street Place. Citibank asked for a 180-day extension but the City on Oct. 2 refused the request. The parties were advancing through a mediation process, Norwalk Communications Manager Joshua Morgan said in mid-October. Citibank is working to address its blight issues but the $100 a day fines are still being levied, Norwalk Chief Building Official Bill Ireland said Wednesday. 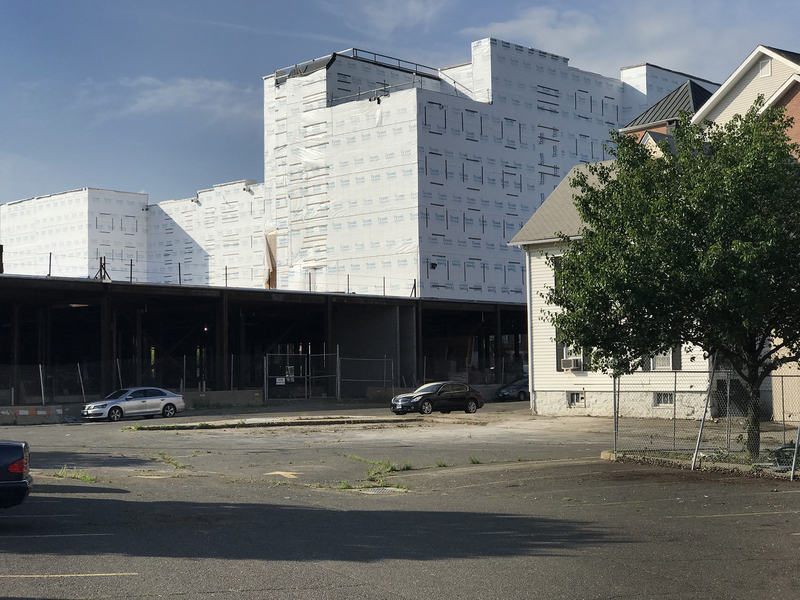 Norwalk on Sept. 18 cited Citibank for blight because of mold, rot and other issues in the stalled development, long-wrapped in Tyvek. The Tyvek is no longer blowing in the wind, Ireland said Wednesday. Citibank has not requested a hearing, and “we won’t stop the fines,” which started in October, Ireland said. Norwalk in an Aug. 6 letter to Citibank demanded a plan to complete the construction of the windows and the façade before inclement weather starts. The $900,000 fraudulent payment was deliberately kept under wraps from the public for two years. Thanks to NON intrepid reporting reporting, it came to light. Rilling had ‘no comment’ for Monday’s story about this loss of taxpayers funds even though he had two years to think about it. A leader who needs an assistant mayor and a communications director to help him in forming an opinion is not a leader. The statement should have been delivered by November 13th at the latest! No doubt it will be mostly nonsense & excuses so I will answer the 3 questions. With a large useful parking lot that served as a courtyard for the area buildings. It allowed for ample parking for 2 theaters, several restaurants, numerous retailers and the headquarters or a regional bank that had 2 entrances. We have a hulking, rotting Tyvek Temple that is literally and figuratively choking off the area. It is by far the tallest building in the area. It looms over and blocks the sun from the 2 to 4 story charming historic neighboring buildings. The 15-foot wide concourse that connected Wall St to Isaac St is fenced off and as of last week boarded up. The only other ways to get from Isaacs to Wall is an unlit sketchy 4 foot wide alley between an abandoned dilapidated nightclub & the blighted stalled construction site or you can walk against traffic in the middle of the temporary one way street that is nicely decorated with jersey barriers that encroach into what should be a two way street. Mostly because a bunch of incompetent bureaucrats had grand ideas that they could be developers. That had bad vision, poor execution and they were tone deaf. The area stakeholders and the majority of taxpayers clearly and emphatically express what they want for the area every chance they get. It ain’t the POKO project! It is to keep the historic character and charm of the area. Keep & build 2-4 story structures. We continue perpetuating this nightmare because our leadership does not possess the knowledge or skill solve this mess. They refuse to face reality. All of the public exposure is good because it gives a chance for the truth to come out. The truth is POKO is dead! It was poorly conceived and it was never really viable. we will get on a path to a wonderful solution the minute the city drops its frivolous lawsuit against me, and they start listening to my ideas! My ideas that were formulated by interacting with and listening to the people. Thanks for recognizing Nancy’s intrepid reporting. We rely on Nancy for vital news about our City. Nancy relies on us for the financial support that makes these reports possible. Through Dec. 31st, the first $1,000 of each gift is doubled, thanks to NewsMatch and support from the Knight Foundation, the MacArthur Foundation, the Gates Family Foundation, and others. New or increased monthly donations are matched 12:1, up to $1,000. Gifts from donor-advised funds and family foundations are eligible for the match. Every donation matters. Every gift has at least twice the impact! Let’s do a little survey. Survey Monkey has the following 2 questions. Should the City continue its frivolous lawsuit against me? If they do, who will win the lawsuit? Citi reports financials with accuracy to $100,000,000. At this rate it will take 2700 years for this to even bear mention in their annual reports. Will the bill for the legal team be released one the settlement is final? Jason the lawsuit against the city on Firetree even if they lose will be over a million dollars the same amount that will be lodged against the city when the property values are fought. Most of us are looking at a 100,000 increase where real estate reports said we lost 100,000 in value , anyone you know could take a loss like that added up? City hall refuses to talk to us on what mislead or who mislead Tyler on this issue. I’d love to work for the City – Great pay and benefits and ZERO accountability… This goes all the way up to the Mayor. Bob thank you for detailing the facts behind recognizing Nancy’s intrepid reporting. I keep reading all the posts and wonder does anyone realize how Nancy got here? The dues this journalist has put in is part of the hard work to get here. Hours sitting at the police station waiting for reports for stories was always a game of sorts. Standing in wind driven snow for that great shot, chasing fires watching the fire dept save the foundation, walking thru debris fields at accidents is how most started out. Nancy was no exception. Standing behind large objects away from potential gun fire.I always found a dumpster. Going to meetings and making dull uncooperative elected officials look good. Taking pictures and be chased down for taking innocent pictures in the name of free press. Having mayors go after her because of her stories was always a pastime of a certain mayor. The road it took to learn and navigate a city of red tape is a feat not a assumed job description . Lets thank her for more than bringing the news but how she got here, nothing was easy nothing comes with loads of gratitude. The news business has changed over the years , limiting space for articles based on inches elsewhere has never effected NON this is why independent reporting and trusting the staff of one works, Eric needs to be included in all thanks for many reasons that needs no explanation. I think this next year Ill learn how to spellcheck and keep one of those dictionaries I pass out for myself. I figure if a put a whole sentence together and make sense no one will think I wrote it. To this day i still get corrected emails from those still trying to work with me. I agree with you Bob I still link articles to thousands of people using social media and when working with State or federal agencies on some of Nancy’s articles, one recently was classified by the Army Corp for its facts content and insight, suggesting the writer had information not given to them for review. Today Tyler from Texas is going thru a few article’s from NON for information not given by the city ,and the city hired Tyler. Proof again reporting is not shooting from the hip but vetting is just as important as the intrepid reporting. This was never about the comments its about the free press and the ability to interact with the stories, making everyone happy is never going to happen and while policing the site is not anyone’s favorite but it works and for that the entire staff should be thanked. Hearst and 12 was always known for its slant reporting but between what Mark Eric and Nancy started and Nancy has continued is why we all should be thankful all the news in the city has improved . IT at city hall took no time to fix an email problem this week customer service is working at city hall better than in the past. Everyone there reads NON its a city asset I was told. @Sue Haynie is absolutely and perfectly correct. Even with 2 years – an assistant, a PR manager, and a better “spam-of-no controls” – mumbles the mayor Harry couldn’t find a word. Here is the bigger question? How many more of these are out there? Harry clearly has a virtual zip-lock on the whole cabal of townies who knew about this, but figuratively speaking – decided voters didn’t need to know the facts pre-election, as @Debora Goldstein pointed out with her appropriately titled “questions” comment (“Norwalk wired 900k to scammers” NoN-article). Norwalk – your mayor just showed you the extent of his respect for the taxpayers. Why not just get a pic of him flipping the bird and be done with the charade? Another question – how exactly does secrecy help solve a crime like this? Or is this secrecy about something other than the 900k? And to Rick’s point – what are the legal costs? Where are those details buried in the budget? Because there is a host of lawyers and law firms making a bundle off Norwalk’s bumbling bungling incompetence and mismanagement lead by the mayor. Finally – to @Mitch Adis’s point – if the facts are accurate, we’ll re-coup $490k of the $900k – so the “loss” will be only $410k. Here’s a suggestion: reduce Harry’s pension by the shortfall. See if he thinks that’s no big deal. Lisa – it’s time. Who else in Norwalk is ready for transparency & competence? The “scam” and the efforts to keep it under wraps illustate what many of us have long claimed about Mayor Rilling’s leadership and management abilities at City Hall. As does the refusal to identify/criticize/removal those responsible high paid City employees for this deficiency. Norwalk residents continue to pay a heavy price for unsatisfactory management at City Hall. Other cities manage to avoid such embarrassments. Why Norwalk ? Amateur management ? Maybe there’s something to be said for electing officials with skill sets and experience to manage effectively a $400 million City budget. Other cities seem to understand this requirement. It is anonymous so I cannot see who the people voting to continue the lawsuit are. What do they think they win with the lawsuit? Whatever it is they could also just ask for it, I might give it?? The Hour reported that the scam was discovered in October 2016. Interesting that it was a month before the local elections yet it doesn’t officially make news until the end 2018. NancyOnNorwalk reported (on Monday) that the scam was discovered in November 2016: https://www.nancyonnorwalk.com/2018/11/norwalk-looks-to-settle-lawsuit-stemming-from-hefty-loss-through-online-scam/ That’s according to the complaint filed in Stamford Superior Court. Takes less than 1 minute and is anonymous. can a mayor and council be impeached ?? time we citizens did something other than complaining on nancy on nlk. anyone game to start demanding answers and penalties if we do not get them. No impeachment. No recall. Not in Norwalk’s charter. @patrick cooper, fantastic idea to reduce rillings pay or pension by EACH of the astronomical amounts he so stupidly and arrogantly screwed up. Let’s start holding rilling financially responsible for his utter disgustful stupidity. If the scam happened in private industry and those employees involved would suffer consequences. But this is Norwalk where our Mayor – a former Police Chief overseeing a $400 million City budget – just says its OK. And no one seems accountable. Must be the Tooth Fairy. No wonder Norwalk has such a poor reputation especially among local businesses for its amateur approach to City management. And citizens who don’t seem to really mind. § 1-669 Matters subject to referendum; procedure. Any provision of the Charter of the City of Norwalk to the contrary notwithstanding, every ordinance hereinafter enacted and every exercise of authority of the Common Council, Board of Estimate and Taxation, or any other City Board or Commission, except as otherwise prohibited by the Acts of the General Assembly, the Constitution of the State of Connecticut or the Constitution of the United States, or as exempted in accordance with Paragraph 12(c) hereinbelow, shall be subject to referendum, as hereinafter defined, which results shall be binding upon the Common Council, Board of Estimate and Taxation, or any other City Board or Commission which enacted the ordinance or exercised the authority which is the subject of the referendum action. The term referendum, as used in this Article, shall be defined as provided in Section 9-1(n) of the Connecticut General Statutes. Upon a petition of not less than 8% of the electors of the City of Norwalk qualified to vote in the previous general election filed in accordance herewith with the City Clerk asking that any such ordinance or exercise of authority be submitted to the votes of the city, such ordinance or exercise of authority shall be so submitted. No ordinance or other exercise of authority shall be subject to referendum unless, within seven days of the time that the ordinance is passed or exercise of authority is taken, a written request including the particular question or proposal to be subject to referendum is filed by at least five electors of the City of Norwalk, duly notarized, for the issuance of forms of petition for the referendum with the City Clerk, together with a fee of $25. Within three days of the receipt of a request in accordance with Paragraph 2 above, the City Clerk shall cause to be prepared a form of petition for referendum in at least 500 copies, each of which shall be marked with the Seal of the City of Norwalk, and shall notify by registered mail the electors named in the aforesaid request for petition forms that the said petition forms are available in the office of the City Clerk. The petition forms shall be available at the office of the City Clerk on the day that the notice is mailed as hereinbefore provided and shall be released by the City Clerk upon demand at that time or any time thereafter to any of the electors referenced in Paragraph 2 hereinabove. No ordinance or exercise of authority shall be subject to referendum unless, within 25 days of the mailing of notice in accordance with Paragraph 3, there shall be returned to the City Clerk as a lot by any of the named electors of the aforesaid request for petition, the petition forms containing the signatures, with addresses, of 8% of the electors of the City of Norwalk on the petition forms requesting such referendum issued by the City Clerk. The City Clerk shall cause the question or proposal to be reprinted on each petition form as submitted by the electors in their written request for the issuance of petition forms pursuant to Paragraph 2 above, except that the City Clerk may rephrase or remove any language which is ambiguous, misleading, scandalous, libelous, repetitive, presents the question or proposal in an outlandish or impractical form, is inconsistent with Paragraph 5(b) hereof, or is otherwise contrary to law, but in no event shall the City Clerk rephrase or remove any language in such a manner which could contravene, defeat, vary or evade the clearly expressed purpose and intent of any question or proposal so submitted which may lawfully be the subject of referendum under the provisions of this Article, the Acts of the General Assembly and the Constitution of the State of Connecticut. When the question or proposal to be reprinted concerns the capital budget, operating budget, any other appropriation, or any part thereof, the question or proposal may either i) call for disapproval of the capital budget, operating budget, any other appropriation or any part thereof, or ii) specifically state whether the capital budget, operating budget, any other appropriation or any part thereof is to be decreased by a specified dollar amount or percentage. If the question or proposal as submitted by the electors in their written request for the issuance of petition forms pursuant to Paragraph 2 above specifically states whether the capital budget, operating budget, any other appropriation or any part thereof is to be decreased by a specified dollar amount or percentage, the City Clerk shall specifically and clearly state such dollar amount or percentage of decrease in the question or proposal reprinted on the petition forms. Each person whose name appears on this page personally signed the same in my presence. Each person whose name appears on this page is either personally known to me or satisfactorily identified himself or herself to me. I recognize that the above statements are made by me subject to the penalties for false statement. A referendum may be had hereunder as to the whole or any part of any ordinance or exercise of authority of the Common Council, Board of Estimate and Taxation or any other City Board or Commission, except as otherwise prohibited by the provisions of this Article, the Acts of the General Assembly, the Constitution of the State of Connecticut or the Constitution of the United States or as exempted in accordance with paragraph 12(c) hereinbelow. The number of validated signatures necessary to equal the signatures of 8% of the electors of the city. On each page of said petition forms the number of valid signatures thereon. The City Clerk shall, within two days of the receipt by him of the petition forms from the Town Clerk, issue a statement by registered mail addressed to the electors named in the request for petition forms pursuant to Paragraph 2 above either verifying the timely receipt of the petition forms in proper order containing the signatures of 8% of the electors of the City of Norwalk or shall so issue a statement that such petition forms were not timely received by him or were not in proper order or contained less than the signatures of 8% of the electors of the City of Norwalk. No action shall be taken pursuant to any ordinance or exercise of authority subject to referendum under this Article until seven days shall have passed after the adoption of such ordinance or after the taking of the decision to exercise authority as aforesaid. In the event that a request is received by the City Clerk in accordance with Paragraph 2 above, no such action shall be taken until the City Clerk shall have issued a statement pursuant to Paragraph 7 above. In the event that the City Clerk issues a statement verifying the timely receipt of petition forms in proper order containing the signatures of 8% of the electors of the City of Norwalk, then no such action shall be taken until the referendum election on such ordinance or exercise of authority is held and the ordinance or exercise of authority is upheld; provided, however, that any ordinance or exercise of authority designated as an emergency measure by the municipal authority so acting shall be fully and immediately effective unless and until disapproved at a referendum election. In the event that the City Clerk issues a statement verifying the timely receipt of petition forms in proper order containing the signatures of 8% of the electors of the City of Norwalk as provided in Paragraph 7(b) above, then within three days of the date on which the statement verifying the petition forms is deposited in the mail, the Common Council shall meet and determine the date of the referendum and shall instruct the City Clerk to issue a warning according to law; provided, however, in the case of a special election, such warning shall be issued by the City Clerk within three days after instruction by the Common Council. Any referendum election concerning the capital budget, operating budget, any other appropriation or any part thereof shall be held at a special election not earlier than 17 days nor later than 25 days following the day upon which the City Clerk, upon instruction from the Common Council, issues a warning therefor by publishing a notice thereof in a newspaper having general circulation in the City of Norwalk. Any other referendum election shall be held at the next general election if such general election is to be held within six months from the date of verification by the City Clerk as provided in Paragraph 7(b) above; provided, however, that if such verification by the City Clerk as provided in Paragraph 7(b) above occurs less than 60 days or more than six months prior to the general election, then the referendum election shall be held at a special election not earlier than 17 days nor later than 25 days following the day upon which the City Clerk, upon instruction from the Common Council, issues a warning therefor by publishing a notice thereof in a newspaper having a general circulation in the City or Norwalk. No question or proposal shall be approved, unless at the election at least 25% of the electors of the City of Norwalk cast a ballot with respect to such question or proposal. Every referendum pursuant to this Article and any question or proposal approved by the electors of the City of Norwalk shall be binding, final and mandatory upon the Common Council, Board of Estimate and Taxation or any other City Board or Commission which enacted the ordinance or exercised the authority which is the subject of the referendum action, unless the same has been exempted in accordance with Paragraph 12(c) hereinbelow. If, upon the official determination of the result of such referendum, the question or proposal has been approved by the electors, such question or proposal shall take effect forthwith. Whenever the question or proposal so voted upon concerns the capital budget, operating budget, any other appropriation or any part thereof and the question or proposal as submitted by the electors in their written request for the issuance of petition forms pursuant to Paragraph 2 above specifically provided whether the capital budget, operating budget, any other appropriation or any part thereof is to be decreased by a specified dollar amount or percentage, the decrease shall take effect forthwith; provided, however, that the appropriate municipal authority shall meet within three days of the referendum to determine in what manner the mandated decrease of the dollar amount or percentage shall be effected, unless the manner of the implementation of the decrease is otherwise provided for in the question or proposal so approved, in which event no such meeting shall be required. Whenever the electors of the City of Norwalk approve any question or proposal at any referendum requiring the operating budget to be decreased, the Board of Estimate and Taxation shall meet within three days and shall lower the mill rate in accordance with the decrease. Nothing herein shall be interpreted as requiring any action by the Board of Estimate and Taxation in order for the decrease to take effect forthwith. As to the manner of the implementation of the exercise of the decrease, the provisions of Paragraph 11(c) above shall apply. In the event that a referendum is held and the capital budget, operating budget, any other appropriation or any part thereof submitted to the electorate in the referendum shall be disapproved, but the question or proposal as submitted by the electors in their written request for the issuance of petition forms pursuant to Paragraph 2 above did not specifically provide whether the capital budget, operating budget, any other appropriation or any part thereof is to be decreased by a specified dollar amount or percentage, then within three days after said election the Board of Estimate and Taxation shall hold a public hearing on said appropriations and shall make such alterations or adjustments therein and shall decrease the tax rate to correspond to such changes as are appropriate to reflect the wishes of the electors; provided, however, that the Board of Estimate at said meeting shall not approve any increase in total appropriations above the amount provided for in the disapproved budget, appropriation or part thereof. Notwithstanding any other provision hereof, if two or more conflicting questions or proposals shall be approved by the electors at the same referendum election, the question or proposal receiving the greatest number of affirmative votes shall prevail in all particulars as to which there is a conflict, so long as such question or proposal has met the requirements of Paragraph 10 of this § 1-669. Notwithstanding any other provision hereof, any appropriations fixed by the Board of Estimate and Taxation pursuant to Sections c, d or e of this paragraph shall be final, and the actions taken by the Board of Estimate and Taxation pursuant to said sections shall be exempt from any further referendum as to said actions. Each paragraph, subparagraph and each provision of each paragraph and subparagraph of this Article shall be separable, and the invalidity of any portion of any paragraph, subparagraph or any provision of any paragraph or subparagraph shall not affect the validity or enforcement of any other portion. Should any provision be found to be invalid as to any circumstance, such provision shall apply to all other circumstances to which such provision may lawfully apply. When a period of time is prescribed for the doing of any act, or as to Paragraph 8 above prescribed for the doing of any act, Sundays and holidays shall be included in computing such period, except that, if the last day of such period is on a Sunday or holiday, such day shall not be counted, and the last day shall be the day following such Sunday or holiday. Should any provision of § 1-669 of this Article conflict with any other provision of any other section of this Article, or any other Article, of this Charter, the provision of § 1-669 shall apply, be considered supreme, and supersede such other provision, unless such other provision specifically states that it is exempt from the application of this § 1-669. Editor’s Note: Approved by the electorate a the general election held 11-5-1974. Former § 1-669, originally part of Article XXII, Extension of Fire Protection, was repealed by Charter Amendment of 11-3-1970, effective 7-1-1971. Editor’s Note: Approved by the electorate at the general election held 11-2-1976.